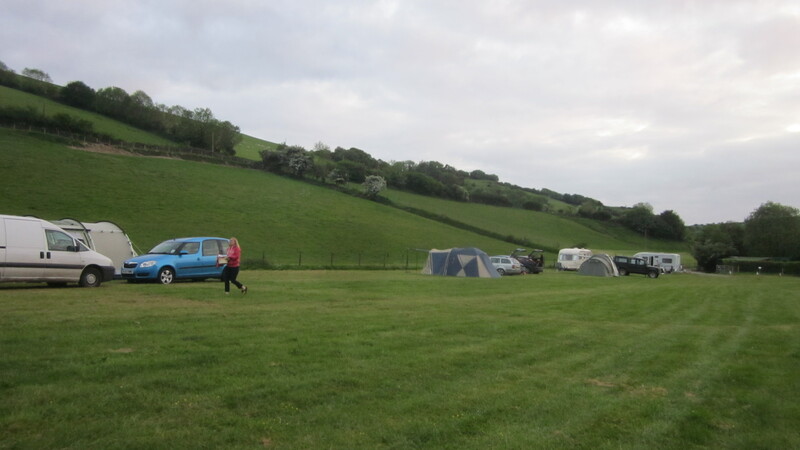 The review: In my ‘campsites to visit’ spreadsheet (yes, I am that obsessed), I have a campsite I have annotated as ‘Leeford Farm, the new Cloud Farm?’. Having found Cloud Farm packed to bursting, the natural response was to try Leeford Farm, only a few minutes drive down the valley. Leeford Farm offers riverside camping. There is one large flat field, bordered on one side by the river, and a couple of other fields that have some flat areas. Campfires are allowed and the farmer comes round selling bags of very well priced and good quality logs. Leeford Farm, the river runs along within the trees. The other edge of the field. It is not quite as picturesque as Cloud Farm, the land around is mostly sheep fields but don’t get me wrong it is still a very pretty spot. We happened to pitch next to the place where it is easiest to get down the the river, a little river beach, the perfect spot for that morning cup of tea and endless entertainment for the kids. Kingfishers and an otter have been spotted here. 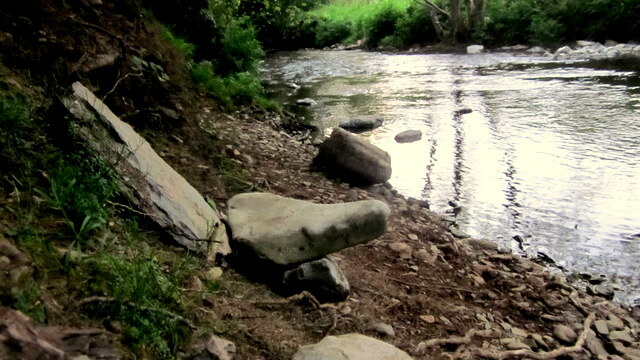 A fellow camper had made this cool river seat out of the stone around. Perfect cup of tea spot! The facilities do need a mention, this is not four star camping. The facilites are basic. However, there are two toilets and two showers. The showers are apparently pretty good and certainly spacious. There is also an under cover washing up area. All of this is housed in a repurposed farm building. it is not luxurious or attractive but it does the job. 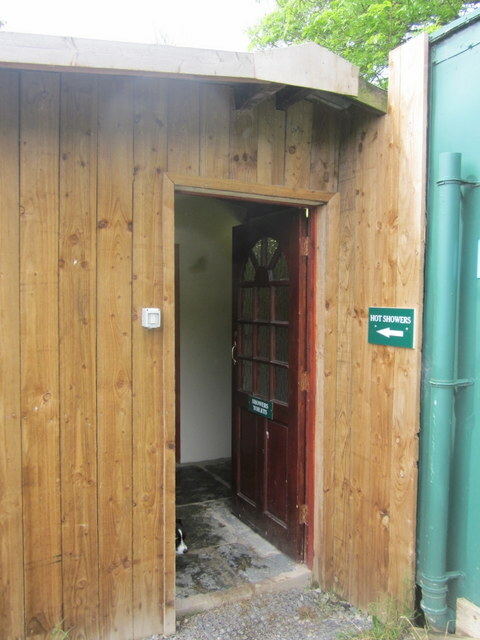 Although, there were quite a lot of campers the toilets were always as clean as you could reasonably expect them to be. I didn’t much fancy using the towel hung on the back of the door to dry my hands though. 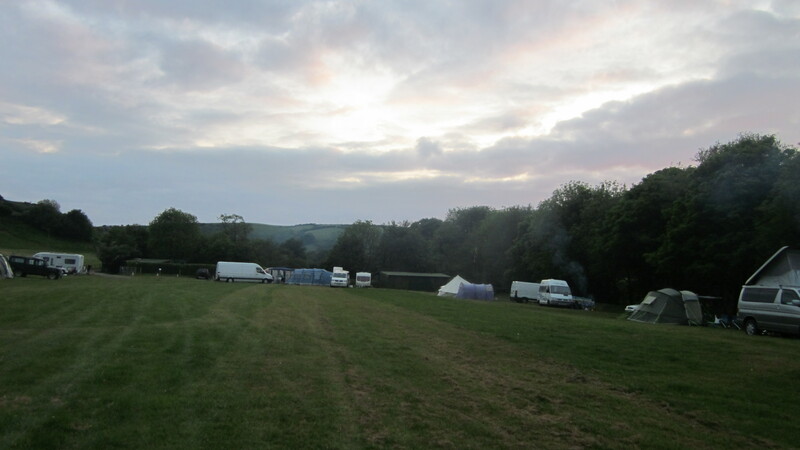 We camped on the very busy Jubilee weekend and by Sunday the site had filled up considerably. In fact we were almost squeezed out of our pitch by a large group of family tents which pitched right next to us. The very affable farmer, Ray, has not instituted any rules which is good in some ways but perhaps a minimum distance from the next tent would be good. There was also a large group on the other side of the field playing guitar and singing very loudly until quite late, fortunately we were far enough away that we couldn’t hear them. I would not have been happy if we had pitched next to them though. Perhaps a curfew on music would be good. However, this is all part of the rough and ready nature of the site. It does accept large groups and you can rock up without booking. Ray and some neighbouring campers assured us it was never usually that busy, so I would still be willing to give it another go. You can walk into the village of Brendon from Leeford Farm, there is a tea room for cream teas, with an attached restaurant for evening meals and a pub which serves food. At busy times you will need to book to eat at either for evening meals, although the pub does also do a small takeaway menu. 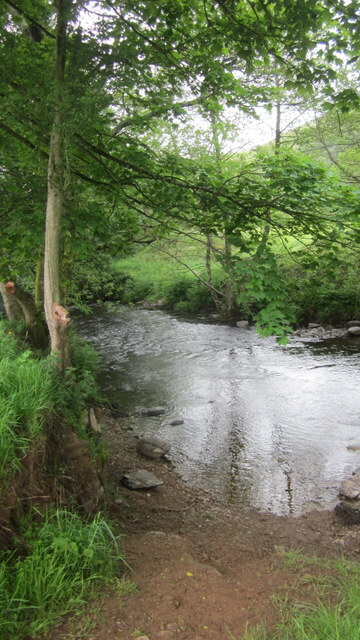 Check out more alternatives sites along the Doone Valley (or the East Lynn River Valley) and in the area. Cloud Farm – the re-visit, nearly.